So the public-facing side of my function is done. Time to dive inside! Of course, as with almost any piece of code, most of the details are very application-specific and not all that critical to the lesson at hand. So I will take liberties will code to focus in on the most relevant aspects, but I will also use this opportunity to suggest some ideas about how best to build such functions to maximize readability and make it easy to maintain. First, the declaration section; what you see here are the usual constants (mostly, to execute "setup" functionality once and not repeat it) and variables. But then you see a number of nested subprograms. In case you were not aware, you can define functions and procedures within other functions and procedures. For a table function that constructs a complex dynamic query, it was crucial for me to hide various construction steps behind a function interface to make it easier to see how the pieces fit together. And now it's time to construct the query. Note that I include tracing both before and after query construction. I imagine it will be pretty obvious why: executing a dynamically-constructed statement isn't hard (I show that next). Putting together something as complicated as the query needed for this report is, on the other hand, a real treat; what's the change I will get it correct the first thirty or so iterations? Being able to see the string I put together is a big help. I don't think it makes a whole lot of sense to go through the query construction in detail. The bottom line is that I was dealing with different materialized views (so: different name of view), and to some extent different names for columns in each view. I used the constants and nested functions (shown above) to avoid repetition and improve readability (perhaps just a little bit, anyway). OK, and now it's time to execute the query, collect the result set with a BULK COLLECT clause, and then send it out to the invoking SELECT. So now you believe me, right? The implementation of a table function is....application-dependent. You are unlikely to build something exactly like this, but hopefully the approach I took (declaring lots of constants and nested subprograms to isolate repeated logic and improve readability) will offer you ideas on optimizing your own table function implementation. Now I must finish up my four hour workshop for the GLOC conference next week. And write another quiz for the PL/SQL Challenge. And start writing the first draft of my Project Solver Call to Action. Steven, came across this post and noticed the seemingly duplicate declaration of c_select_list1. Whilst the declaration can be 'overloaded' as soon as you reference this it should throw a PLS-00371. Thanks, Chris, that is definitely a typo. Not sure how it crept in. Will fix now! I have to say, this is a terrible way to try to teach, explain and illustrate a concept (here, table functions as parameterized views). It's something that is done time-to-time by other folks on t'interweb but it's the first time I've seen it done by your good self. There is so much code in your example that the reader, unless a genius (perhaps like your good self or someone like Jonathan Lewis) is left struggling to discern or distill what the key points are. I should say, for fear of inciting hatred, that I love your PL/SQL tutorials; this is the only one that I can remember in all the years that I've come across them that I'm left thinking, 'WT....' I think this is reflected in the lack of comments on this article. Thanks for writing, Jon (and sorry about the very delayed response). My only excuse is that I was showing code from a "real world example" - and they can be quite complicated. 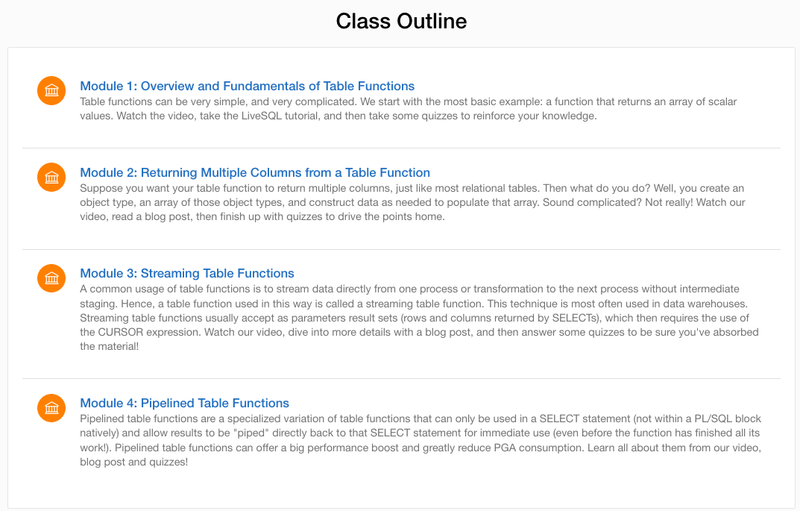 I will update this post to direct readers to my new(er) class at the Dev Gym on table functions, which includes a set of tutorials in LiveSQL. I would very much appreciate it if you would check it out and let me know if they provide an easier, smoother way in to this subject.